I recently cataloged a book from 1701 which is the oldest book I’ve ever cataloged. As I perused the book for specific information needed for cataloging, I found myself thinking about this book that was over 300 years old. The pages were worn. The print was unusual. The cover was soft and smooth. This book allowed me to hold history in my hands and for a moment think about people and events from a much earlier period of time. The book’s title was Anglia Libera : or the Limitation and Succession of the Crown of England Explain’d and Asserted by Jo[hn] Toland. 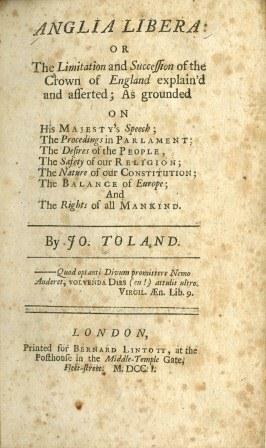 I did not have the luxury of reading the book to find out Toland’s ideas. Instead, in the short time I had the book, I thought about the ephemeral nature of life. I was reminded that some material items will outlive me but even this specific book would one day disintegrate. This small, antique volume gave me pause to wonder and reminded me that people and events come and go. It reminded me that things fade away. It reminded me that nothing lasts forever. Marcus Aurelius once said “All is ephemeral, fame and the famous as well.” One small book from 1701, that I didn’t completely read, was for a moment a reason for me to contemplate my own brief time in history. 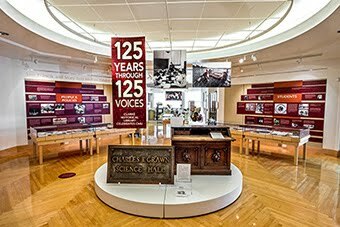 Come find one brief moment or lose yourself in longer periods of thought with the books you will find at the Clarke Historical Library. One old book and one brief moment equals a walk with history.